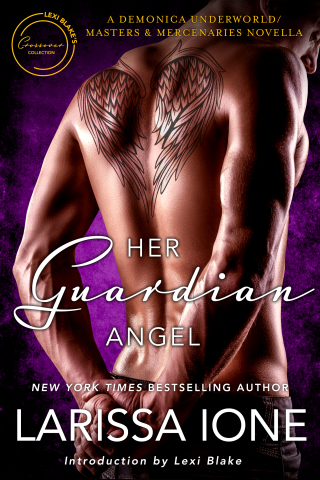 Her Guardian Angel is a crossover that mixes Larissa Ione's Demonica Underworld with Lexi Blake's Masters and Mercenaries world, it's actually part of a collection of crossover novellas in the Masters and Mercenaries world that is designed to introduce readers to a range of new authors and worlds. I have to confess I've only recently discovered Lexi Blake's writing so I'm new to the Masters and Mercenaries series (it's DEFINITELY on my radar now and I plan to check it out asap!) but I love the Demonica world so I couldn't miss this story and I think it works well as an introduction to either series. Declan is a professional bodyguard who works for McKay-Taggart, the company I believe is central to the Masters and Mercenaries series. He takes his work seriously and prefers more dangerous jobs so when he's tasked with babysitting a rich socialite he's not exactly thrilled with the idea. Suzanne isn't what she first appears though, she's actually one of the memitim, an earthbound angel who is tasked with protecting important humans until she can earn her place in heaven. Declan is being targeted by a demon and needs her protection so the easiest way for her to keep an eye on him is if she's around him all day long. I'm not going to say much more about the plot but this was another fabulous paranormal romance from Larissa Ione. I think she did a brilliant job of introducing new readers to a few characters from each series, she definitely did enough to make me curious to check out the Masters and Mercenaries books and I enjoyed catching up with characters I already know from the Demonica Underworld. As a Demonica fan I'm excited by the direction this series is taking and I can't wait to read more about Suzanne's siblings. Suzanne and Declan were a great couple who went through a lot together in a short space of time and that baptism of fire created a strong bond between them. They had brilliant chemistry but also worked well together as partners and I'm sure we'll see more of them as the series continues.